As you drive north on Highway 29 through the Napa Valley, just beyond the little town of Yountville, the valley floor suddenly widens, revealing vistas of vineyards framed by mountains. It looks and feels like a remarkable place. Napa Valley certainly is remarkable. It’s one of the world’s greatest wine regions. And, like France’s Bordeaux region to which it’s always compared, Napa has staked its history and fortunes on Cabernet Sauvignon. Exactly when Cab came to Napa is unknown, although it was firmly established by the late 1800s. During the first part of the 20th century, the likes of Inglenook, Beaulieu, Louis M. Martini and Charles Krug showed savvy insiders how good Napa Valley Cabernet could be. However, the wider world of wine lovers only began to take notice in the 1970s. That was after a Stag’s Leap Wine Cellars Cabernet Sauvignon bested all other red wines, including top Bordeaux, at the 1976 “Judgment of Paris” tasting. Overnight, Napa Valley was on every connoisseur’s lips. What makes Napa so congenial to Cabernet Sauvignon? After all, Bordeaux sits further north in latitude, making it colder and wetter. But Cabernet has thrived there for centuries. Indeed, Bordeaux made Cabernet’s reputation. The late winemaker André Tchelistcheff—Napa’s most significant influence of the past century—ascribed the valley’s success with Cabernet to three factors: its microclimates, soils and modern viticultural practices. Napa’s warmer than Bordeaux, but the climate pushes Napa’s grapes to a ripeness that Bordeaux only achieves in its warmest years, which reviewers love to dub “the vintage of the century” (and which Bordeaux seems to enjoy every 10 years or so). The wag who said, “Every year is a vintage year in California,” largely got it right. We might forgive Tchelistcheff for concentrating on that area, the historic heart of the valley, where he had the most experience. When “The Maestro” died in 1994 at age 92, Napa’s other regions were still developing their viticultural prowess. Today, Napa’s mountain districts—Veeder, Diamond, Spring, Howell, Atlas Peak—as well as southern areas like Coombsville and northern ones around Calistoga, yield Cabernets that are different from those of Oakville-Rutherford benches, but no less beautiful. Think of Napa’s 16 subappellations as a string of pearls. 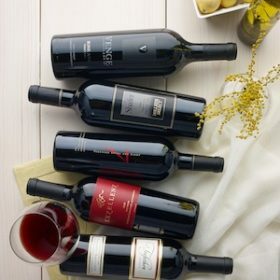 A well-made Napa Valley Cabernet Sauvignon has a lush texture and is full bodied yet ethereal, with a fruity ripeness that smacks of warm, sunny summers. The precise flavors can veer from vintage to vintage, vineyard to vineyard. In general, however, blackberries and cherries abound, with relatively high alcohol giving a liqueur-like headiness, often enriched with chocolate and licorice notes. Aficionados debate the finer distinctions: How Oakville differs from Rutherford, how the Vacas distinguish themselves from the Mayacamas, the comparison of valley floor and mountain wines. But no wine region on Earth has better viticulturalists than Napa Valley, as Tchelistcheff said. The intricacies of canopy management, vine spacing and watering schedules make all the difference. Today, during blind tastings, even experts have a hard time identifying where in Napa any particular Cabernet was produced. Still, rough templates can be drawn. 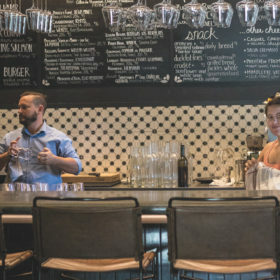 The southern districts—Yountville, Coombsville and Oak Knoll—are cooler, because they are closer to San Pablo/San Francisco Bay. Hence, they yield tighter, more elegant Cabs. Thirty miles north in Calistoga, the hotter temperatures make the wines soft and opulent. Some people swear that Oakville Cab is all about blackberries, while Rutherford tastes of sour red-cherry candy. Mountain wines, because of the volcanic stones in the soil, sometimes have a tang of minerals, although just how to define mineral is an ongoing debate. Grapes from the mountains also tend to be smaller than those from the flatlands, making for more concentrated and tannic Cabernets. Yet, even the mountains present complexities. Which direction does the vineyard face? Which way do the rows run? What time does the summer sun rise and set on the vines? All this influences the grapes as much as elevation. So, too, does the vintner’s blending pattern. An 100% Cabernet Sauvignon will be bigger, darker and more tannic than one blended with Merlot and Cabernet Franc. But any Napa Cabernet, regardless of blend, will age well, provided it starts out balanced. During the past 10 years, critics on both sides of the Atlantic have charged that Napa’s wines are too ripe and high in alcohol. Some also accuse them of being too oaky, although this argument is harder to sustain. This criticism is outweighed by the prices that top Napa Cabernets fetch. Demand far outstrips supply. Also, the past few growing seasons (2010–12), have been cool, yielding lower sugar levels at harvest. But if you harvest too early, the wines can taste green or unripe. Nobody wants Cabernet Sauvignon to taste like asparagus and bell peppers. Timing the harvest is the winemaker’s biggest decision of the year. Picking, it seems, has its “Goldilocks” moment as well. Today, Napa Valley boasts more than 400 wineries, with more coming on all the time. High-profile luminaries are investing, like Yao Ming (basketball), Boz Scaggs (rock star), Mario Andretti (race car legend), Joe Montana (NFL Hall of Famer) and Bill Foley (mortgage lender/billionaire). If you want to produce Napa wine, the price of admission is prohibitive. Land is more expensive than anywhere else in California wine country. The price for premium Napa Cabernet Sauvignon grapes can top $20,000 a ton. That’s why—cult wine-buying frenzies aside—a top Napa Valley Cabernet will never be inexpensive. But the world’s best wines never are. While Cabernet Sauvignon and other red Bordeaux varieties dominate the harvest in Napa Valley, the region also produces many other red wines. Top picks include Zinfandel and Syrah, especially when grown in mountain appellations, where the fruit achieves great concentration and intensity. Petite Sirah has developed a following in the last few years. It can do well on the valley floor if the soils are well-drained. Sporadic efforts with Sangiovese and Tempranillo suggest promise, but there’s little economic incentive for growers to plant them. Grenache and Mourvèdre don’t do particularly well, although this may be due to lack of effort rather than unsuitable terroir. The climate in Napa Valley is largely too warm for Pinot Noir. However, it does thrive in the Carneros appellation, which sprawls across the southern parts of Napa and Sonoma counties. California’s finest come from here. The wines are lush, yet balanced and dry, with ripe, supple tannins. The best can age for decades. Merlot can be thin in the flatlands, but put it on a hillside and it sings. Smooth and delicious, with red cherry and, often, chocolate. Like Merlot, Syrah loves hill-sides. From Napa’s mountainous appellations, wines are rich in blackberry fruit and soft, often showing bacon and pepper notes. In terms of structure, Napa Valley Zins are the most Cabernet-like in California. Balanced and elegant, they retain a briary and brambly personality. Napa brings balanced elegance to a variety than can be rustic. Always full-bodied and tannic, and often heady, Napa Petites exude fruity richness.